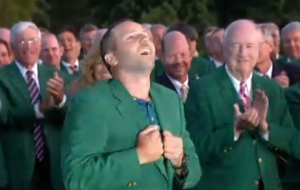 After 73 Majors without a victory, Sergio Garcia won the Masters in a drama filled afternoon. Garcia and Justin Rose were tied heading into a sudden death round on the 18th hole, where Garcia pulled it out to win his first career Major and the coveted Green Jacket. Congrats Sergio! Russell Westbrook made history on Sunday with his 42nd triple-double breaking Hall of Famer Oscar Robertson’s record for a season. Westbrook got a standing ovation immediately after this historic feat, but he didn’t let up as the Oklahoma City Thunder still needed to beat the Denver Nuggets, which they did with his buzzer beater shot giving OKC a 106-105 victory. Kevin Durant was back on Saturday night for the Golden State Warriors. Durant went down 6 weeks ago and many thought he’d be out for the season. It turns out it was a grade 2 MCL sprain and Durant is back for the playoffs and looks like he didn’t miss a beat. Warriors 123, New Orleans Pelicans 101. If there weren’t enough reasons for Patriots haters to continue to hate, now they have one more. The New England Patriots can’t seem to find room in Gillette Stadium to fit their 5th Super Bowl Championship banner. When the stadium was built in 2002, they only had one banner, and no one could have imagined Tom Brady and Bill Belichick would add 4 more titles in such a short amount of time. This is clearly a good problem to have!